Today is a glorious day for “Z” fans! 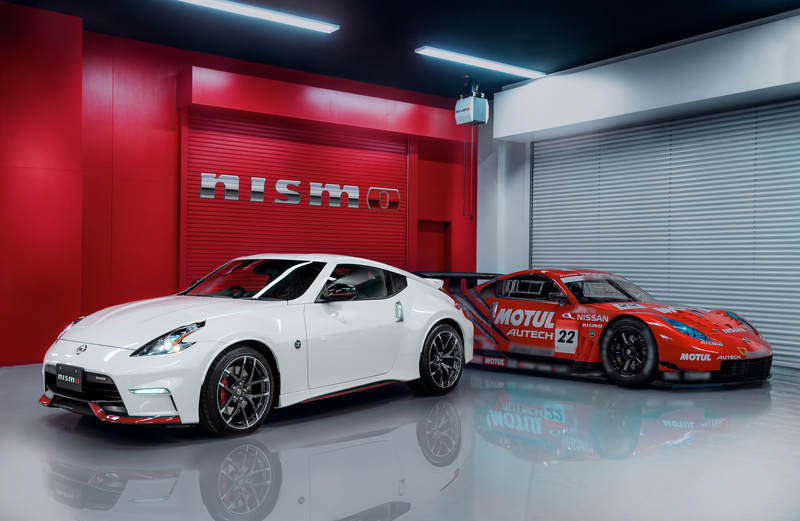 Just a short while ago, to kick off the annual “Z DayZ” event, Nissan debuted the new re-freshed NISMO 370Z! The fact that Nissan would do something like this at an enthusiast gathering rather than having a big production at a major car show is bound to gain them some serious brownie points among the most dedicated of their audience. Good job Nissan! Now, on to the new Z; The most obvious change is the new aerodynamics package which, combined with the color scheme is very similar to what was done with the GT-R NISMO and NISMO Sentra concept that made its debut at the LA Auto Show last year. Nissan claims that the aero package is completely functional (which I wouldn’t doubt) and as mentioned before was heavily inspired by the GT-R NISMO. The engine remains the same as the previous NISMO 370Z but a new 7 speed automatic transmission option will be available and yes, it will have the automatic rev-matching during downshifts. The NISMO engineers also retuned the 4 wheel independent suspension, as well as throwing in a few other NISMO buts to help add more rigidity to the chassis. Cosmetically, the 2015 NISMO Z gets some new wheels, a refreshed interior which includes brand new Recaro seats and a bunch of entertainment tech all controlled via fingertip on a 7 inch touch screen. If you want this, and I am sure you do then you need to visit your dealer now and put in an order because this new NISMO car will be available as soon as July of this year and Nissan hasn’t said how many examples are being produced for the first run so hurry up! Otherwise if you’re content with just looking at the car then click the thumbnails below for HD resolution pics. You can also check out the official press release below as well. FONTANA DAM, North Carolina – There was a surprise “guest” today at ZDAYZ, the annual gathering of hundreds of Nissan, Datsun and NISMO owners and enthusiasts – the world debut of the new 2015 Nissan 370Z NISMO. 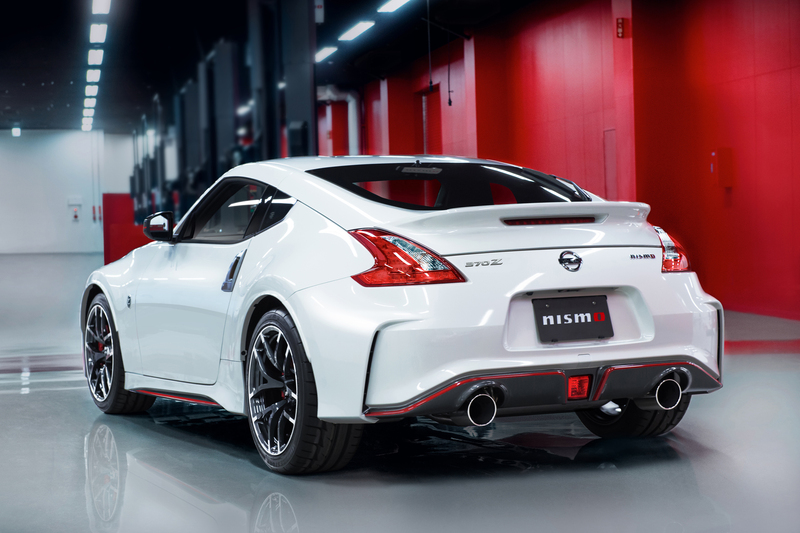 A solid progress for 2015, the new 370Z NISMO model features exterior, interior and performance refinements, along with an expanded model selection that includes both 6-speed manual and 7-speed automatic transmissions and a new 370Z NISMO Tech grade. 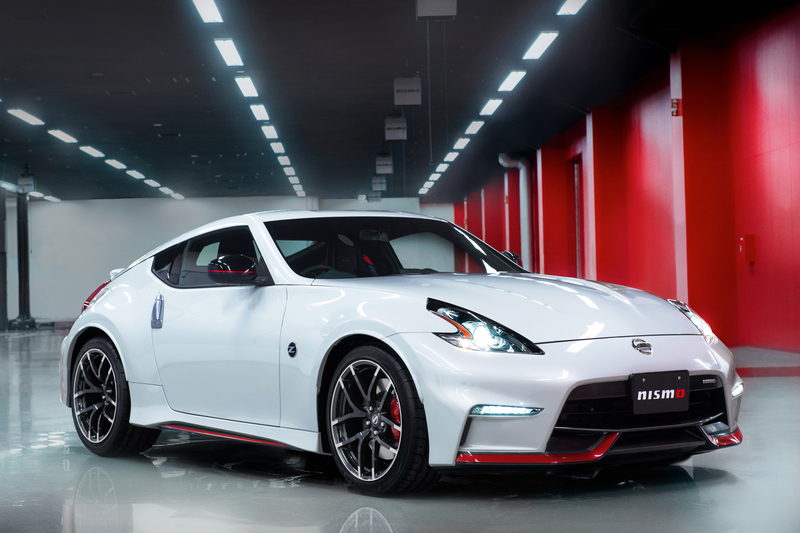 The most striking change for the 2015 370Z NISMO is its revised exterior design. Its GT-R-inspired functional and fully integrated aerodynamic body pieces have been redesigned to provide an aggressive and more aerodynamic new appearance – as well as optimizing front and rear downforce. Key changes include a new, deep front fascia with LED Hyper Daytime Running Lights, black headlight bezels, NISMO emblem and signature NISMO red stripe accent on the integrated front chin spoiler. The red accent continues down the redesigned side sills, on the black-color sideview mirrors and across the lower portion of the redesigned rear fascia. The unique NISMO rear spoiler has been reshaped and downsized. The standard 19-inch NISMO super-lightweight forged aluminum-alloy wheels by RAYS also have been restyled for 2015 with a twin-five spoke design and a charcoal gray machine-finish (formerly silver). Inside, the unique NISMO-styled interior is enhanced with redesigned black-and-red Recaro® leather-appointed seats with Alcantara® accents. The new seats, co-developed with Recaro®, are exclusively designed for the 370Z NISMO to provide more uniform body pressure and better all-direction holding during spirited acceleration, braking and cornering. They also play a key role in providing driving excitement by maximizing the harmony between driver and machine. The interior also features red seat trim and stitching with NISMO logo, an Alcantara®-appointed leather-wrapped steering wheel and NISMO red tachometer. Also new for 2015 is the 370Z NISMO Tech model, which adds a hard drive-based Nissan Navigation System with 7.0-inch VGA touch-sensitive display, RearView Monitor, Bose® Audio System, SiriusXM Satellite Radio (SiriusXM subscription required, sold separately), Streaming Audio via Bluetooth®, auto-dimming rearview mirror and HomeLink® Universal Transceiver. As in previous years, the 2015 370Z NISMO is powered by a potent 350-horsepower 3.7-liter DOHC V6 engine with Variable Valve Event and Lift Control (VVEL). The engine is matched with an exclusive, tuned H-configured exhaust system design, muffler tuning and an optimized calibration is installed to help create 18 horsepower more than a standard 370Z Coupe. Torque is rated at 276 lb-ft.
Two transmission choices are offered for the first time on the Z NISMO model. The close-ratio 6-speed manual transmission features standard SynchroRev Match®, the world’s first synchronized downshift rev matching manual transmission, which allows rev-matched heel-toe-like downshifting. Newly available is a refined 7-speed automatic with Downshift Rev Matching (DRM), Adaptive Shift Control and manual shift mode with paddle shifters. The 370Z NISMO also features a refined 4-wheel independent suspension, NISMO-branded strut tower brace for enhanced body rigidity and a pair of performance dampers to help minimize road-input vibrations and help contribute to the NISMO 370Z’s high levels of handling and performance feel. The NISMO tuned suspension includes special springs and stabilizer bars. Large Nissan Sport Brakes and a Viscous Limited-Slip Differential (VLSD) – with a shorter final drive ratio for better acceleration feel – are also standard on the 2015 370Z NISMO. 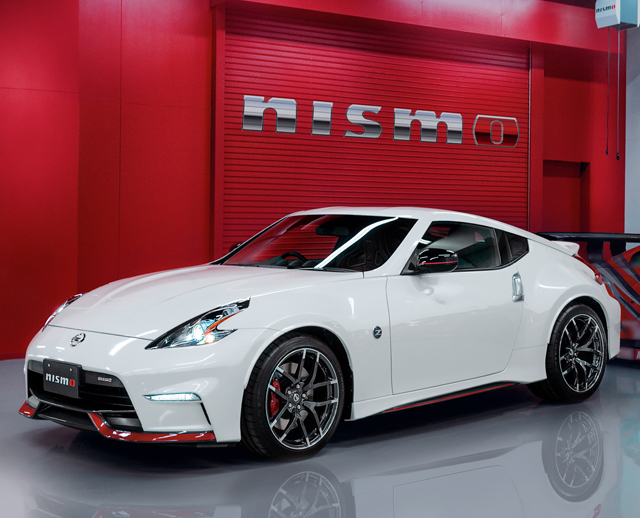 The 2015 370Z NISMO is offered in just four exterior colors – Solid Red, Magnetic Black, Brilliant Silver and Pearl White. It is set to go on sale at Nissan dealers nationwide in July 2014.